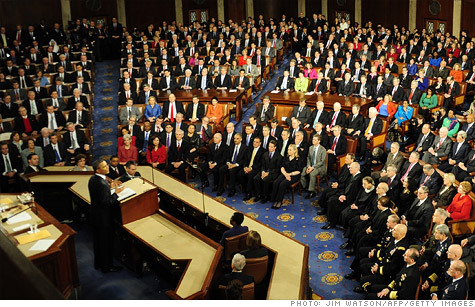 Groundhog day, Climate change and Obama’s Inauguration and State of the Union message. – Len Bilén's blog, a blog about faith, politics and the environment. 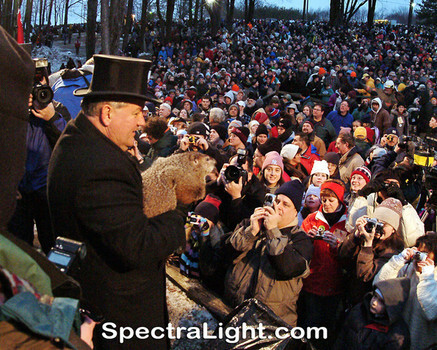 Groundhog day, Climate change and Obama’s Inauguration and State of the Union message. Groundhog Day is over. Next step in prognostications of questionable value is the President’s State of the Union message. Punxsutawney Phil did not see his shadow this Feb 2. Through the ages he has seen his shadow 87% of the time and prognosticated six more weeks of winter. This year he forecast an early spring. His record is pretty good, he has been right 37% of the time. As for the President, there has been a lot of ballyhoo about Global Warming/Climate Change/Global Climate Disruption/Climate Challenges – pick your term. Besides Al Gore who recently sold his Current TV channel to Al-Jazeera, a known champion for Mideast oil, few has been more vocal about Carbon Dioxide “pollution” than President Obama. Let us take the statements one by one and see how well we are doing so far. He has had one full term, so the verdict is in. The most drastic step we have done so far is to outsource manufacturing, mostly to China. In so doing we have actually decreased our energy use while China’s is doubled, and China is now using 50% more energy than the U.S. In addition, nearly half of all coal used in the world is burned in China. Not only that, China’s coal is of the soft, brown, dirty coal variety. It is so bad that Beijing now has the highest air pollution in the world. The soot clouds are carried by the prevailing westerly winds up into the Arctic. (More on that later) Another example of less than stellar action was the “cash for clunkers” program, where “nearly new” cars were destroyed to make room for new, more fuel efficient cars. This was a subsidy for the upper and upper middle class, since they were the only ones that could afford to upgrade. The real clunkers are still left on the road, driven by the less fortunate since the cars they had hoped to upgrade to were taken out of circulation, leading to higher prices for used cars. A true lose-lose proposition. And don’t get me started on Karma and Tesla, highly subsidized electrical play-toys for playboys. What we have done so far to betray our children and future generations is putting us in an unsustainable debt and deficit situation. Obama seems determined to follow the example of Spain. They went green, and in one year’s time their unemployment rate went from 9% to over 21%. It is now 26%. Their debt is as bad as that of Greece and we are headed that way. Our debt per person is over 52000 dollars, Greece’ is more like 47000 dollars. The real threat of climate change is not so much global warming but a possible onset of a new Ice Age. Before you dismiss me as a real whacko, let me assure you that I know CO2 to be a powerful greenhouse gas, second in importance only to water vapor, and without gain or attenuation in the response of the Earth, a doubling of the CO2 levels in the atmosphere would cause a 0.9 degree C warming. As an engineer I look at the impulse response of the earth to a variation in the Sun’s effect on temperatures. There are two overwhelming impulses from the sun. They are called day and night, summer and winter. Let us first take the tropics, since it doesn’t really have summer and winter, only day and night. In an ideal situation, where the sun bakes down on the surface with no clouds and the earth radiates back into space, the equilibrium temperature in the tropics would be about 140 degrees F (60C). But it isn’t, since thunderstorms and winds carry away the excessive heat from the equator towards the poles. One could say the tropical thunderstorms are the thermostat of the earth. The tropics have found its temperature. It was about the same as it is now even during the last ice-age. The absorbance spectrum of saturated water vapor covers the whole IR spectrum, so any amount of CO2 makes no difference. But, you say, what happens at the poles? Glad you asked. The heat is carried towards the poles and comes down as rain or snow or not quite as cold air. Since many temperature stations are located on heat islands such as air ports and urban areas that have suffered significant land use change the most unchanging temperature observable is the melting point of ice. So let us take a look at ice around the poles. 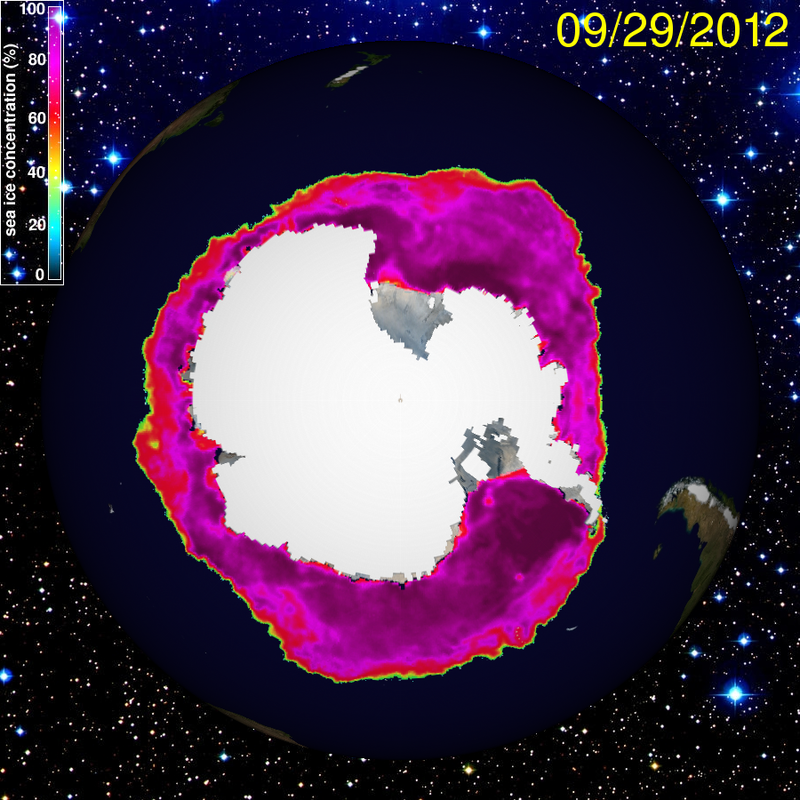 The ice cap over the Antarctic is growing. Between Sep 25 and Sep 29 of last year it hit a new all-time record since measurements begun. Notice the maximum occurred more than 3 months after maximum solar influx – a 96 day delay. 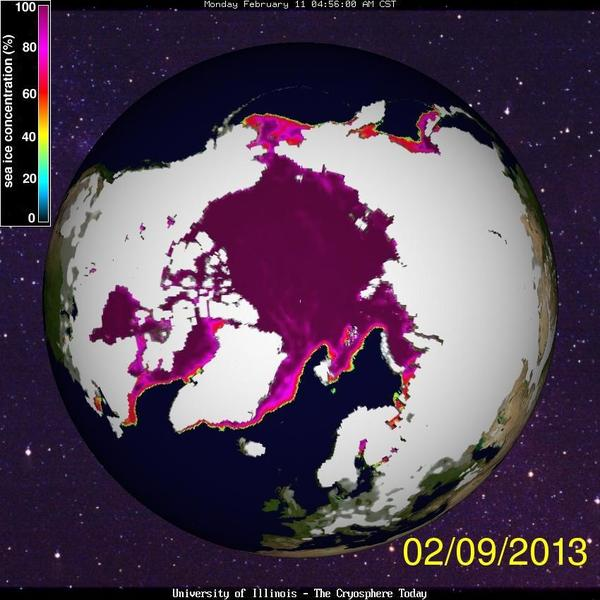 The southern icecap is about 700000 km2 larger than the 30 year average nowadays. Not so the Northern icecap. For a fleeting period around Mar 25 last year it was back to the 30 year average, after that came the most rapid snow melt on record, followed by the most rapid refreezing on record. At the minimum it was about 2.8 million km2 less ice than normal, leading to a flurry of press releases of our imminent demise, and of the polar bears. By the way, the number of polar bears has doubled since its minimum. They do not mind a slightly milder climate. There is now slightly more ice in the Arctic than last year – about 700000 km2 less than the 30 year average. So, the Arctic ice cap is shrinking, but the Antarctic ice cap is growing. Why is that? The CO2 level is the same in both places. Something else must be the cause. Let me suggest: Air pollution. We have outsourced our manufacturing of steel, gypsum boards and other high energy uses to countries like China and the third world. 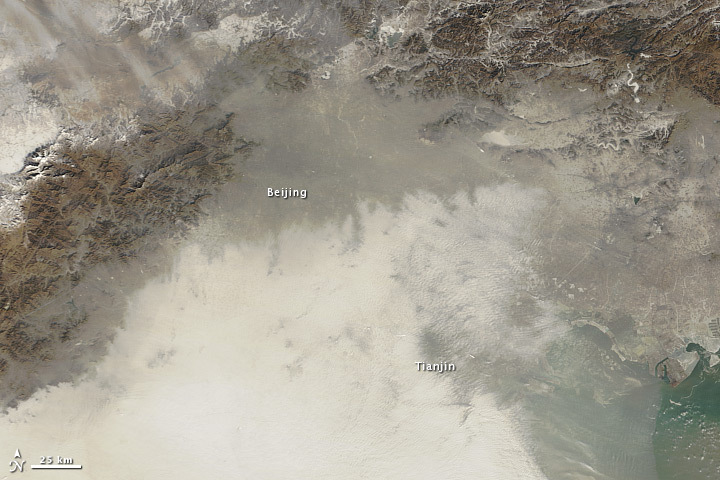 China is by far the world’s leading polluter and the soot cloud runs all the way into the Arctic. 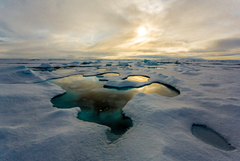 The tell-tale sign of soot pollution is the soot in the bottom of the ice-ponds that form in the summer icecap, leading to a much more rapid ice-melt. This masks an inconvenient fact. It is getting colder. In addition, because of more open water in the fall, evaporation increases and this leads to increased snowfall. Moscow has now the snowiest winter in over 100 years. Alaska broke records last year. The snow cap stretches over much of the northern hemisphere, increasing the reflection of the incoming sunlight, and that means a delayed spring. What does this mean for us? The summers may or may not get warmer, but the winters will get colder in the temperate zone. Storms are formed and driven mostly from temperature differences. 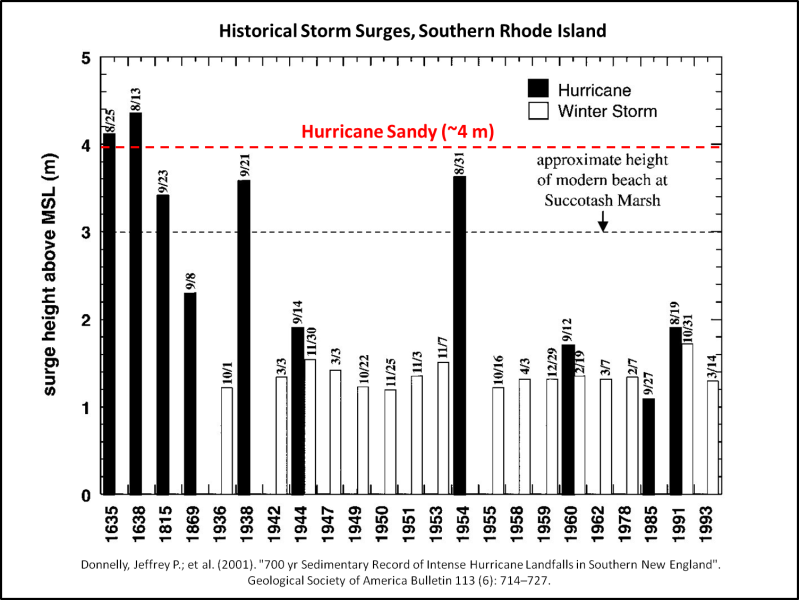 The worst storm recorded on the Eastern seaboard was not Sandy. The headlines claimed the storm surge that hit the U.S. east coast during Sandy was unprecedented, and was caused by global warming. It is my contention that a more likely scenario is that it is an early warning of global cooling. There have been two storm surges on the east coast larger than hurricane Sandy’s. They occurred in the years 1635 and 1638. Ship logs from the 1600’s also show storms were more violent during the little Ice Age. 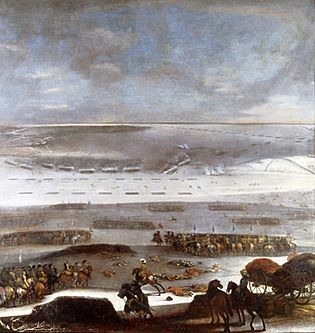 It got so cold that in 1658 the Swedish Army crossed the Great Belt in Denmark and sacked Copenhagen. The Great Belt is now nearly always ice free. The raging fires of 2012 was less than average. The crippling drought of 2012 was less severe than the 30’s dust bowl. Remember “The Grapes of Wrath”. Tornadoes numbered about 30% less than normal and we broke a new record for consecutive days without a death from a tornado. The number of hurricanes and their severity is down. The solution: Increase the amount of CO2 in the air, but reduce the worldwide soot emissions. I totally agree. The regulatory environment makes it nearly impossible to go forward with such worthwhile projects as geo-thermal, thorium-based nuclear power and the like. CO2 is a non-participant in global warming. The earth, mostly through clouds and thunderstorms has wonderful feedback mechanisms, which keep temperatures stable on the warm side. 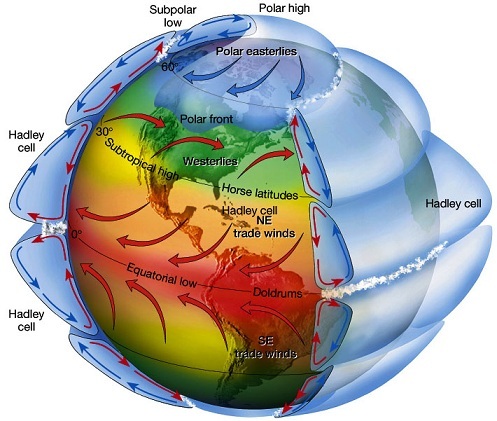 The stabilizing mechanisms grow weaker on the cold side, and normal steady state for the earth is ice age. Increasing amounts of CO2 will delay the onset of the next ice age, and in a small way reduce the severity of storms. We have not had any statistically significant increase in global temperatures for the last 16 years but the amount of CO2 has increased by more than 10%. Are there benefits with an increased amount of CO2? You bet. Thanks to increased CO2 the earth can now feed an additional 2 billion people, people that had otherwise starved to death. For a doubling of CO2, plant yields increase between 40 and 70%. In addition plants use less water to do the CO2 breathing when CO2 increases. This can be seen in the vegetation line growing northward south of Sahara. It is still not a good idea to use ethanol from corn for fuel. Cutting down the rain forests of Borneo to produce biofuel is even worse. Irrigation is sometimes good, sometimes bad. Irrigating from the rivers feeding to Lake Aral was supremely unwise. That displaced about a million and a half people. My suggestion is to attack environmental problems regionally, especially when it comes to land use. Central planning, especially about water use and water pollution is sometimes disastrous. The worst we could do is to entrust this to UN. They apply political considerations rather than scientific and rational every time. To protect ourselves we must take back the energy initiative from China, India and Russia. Let us use scientific facts this time and not again succumb to political rhetoric. Previous Previous post: The ideal 2016 matchup: Sarah Palin vs. Hillary Clinton. Next Next post: A response to the energy portion of the State of the Union Message.